From 1903 Indian and Harley Davidson vied with one another for racing laurels and consumer market. The battle lasted 50 years, the outcome now history. This book tells the story of the contest in words and excellent photographs - a piece of genuine American history which will take pride of place on any bookshelf. 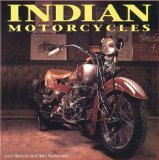 Indian motorcycles dominated the American motorcycle scene during the first 30 years of the century. This book is dedicated to those beautiful machines, from the belt-drive singles to the great V twins of the 40's and 50's.